People don’t like Nicholas Mackenize. And there’s no love lost, because he doesn’t like people. But he saves his real hatred for religion. He is – loudly and proudly – a God-hater. Of all the creatures on earth, Nicholas is on friendly terms with four – a fellow professor and her young son, a dog, and his brother Travis, whose computer genius is even more impressive than his criminal record. Suddenly – you know how life does these things to you – the old curmudgeon is asked to save the world. Not our world, mind you, but someone’s world. To be precise, it’s the digital world his brother created, a world in which he has replicated – not imitated, replicated – human consciousness. There are, as it turns out, few things to open an atheist’s eyes like trying to save a whole world gone bad. 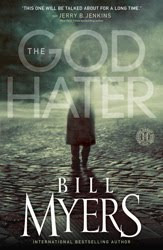 The God-Hater is written after the style of a thriller – secrecy, guns, mysterious “agents”, even a car chase. The characters are well-drawn, particularly Travis and Nicholas. That they’re brothers makes the contrast between them all the more delicious. Myers’ best use of characters is in the digital world, where he brilliantly demonstrates the effects of different philosophies in its people. They may be digital, but they come across as very real. I would raise a couple issues. One, the scenes that show the failure of earlier philosophies can be uncomfortably visceral. I pretty much cringed my way through the beginning of chapter 2. Secondly, the logic of certain things in the story is, at best, unexplained. For example – spoiler warning – Rebekah pulls a gun to help the “big fish”. Later, she’s swimming with the little fish. No sense is made of this, and it feels awfully disjointed. I had one other, much larger issue – but that is tomorrow’s post. In an odd way – there’s little similarity otherwise – The God-Hater reminds me of The Lion, the Witch, and the Wardrobe. Both portray a different sort of salvation in a different sort of world; both help us see the salvation in our own world a little better. Nicholas’ “deeper logic” reminded me of Aslan’s “deep magic” – and about captured the difference between the two worlds. The God-Hater has one high goal, and it races straight to the mark, with a few problems and a lot of nice touches. Shannon, your concluding paragraph is … well, perfect. OK, no piece of writing is actually perfect, I suppose, but you really captured the essence of this book with your analogy between it and The Lion, the Witch, and the Wardrobe. I love it, and your critique (yes, I had some problems too, though I applaud the ambitious goal this slender book went after).